Your fast track to the high-value cloud B2B market. With the industry’s first full-stack SDN/NFV solution available as a service, we can help you launch highly differentiated Cloud B2B services in weeks. 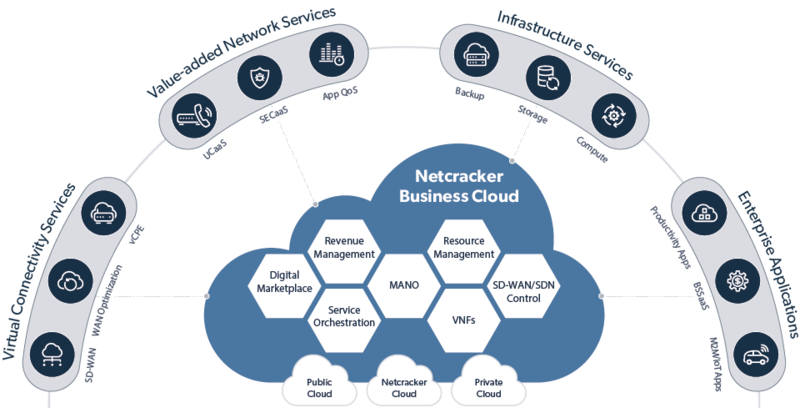 Netcracker Business Cloud eliminates the time, cost and complexity barriers that service providers face towards cloud transformation by running the industry’s first full-stack SDN/NFV solution, from VNFs to orchestration to BSS to OSS to portals and a digital marketplace, as a service. Using Netcracker’s cloud, or a multi-cloud environment together with service provider’s own cloud and public cloud, we take full end-to-end responsibility for the entire suite of services. Netcracker Business Cloud can help you launch new cloud B2B services, such as SD-WAN, in as little as 8 weeks. That’s 8 times faster than a typical self-deployed solution. And through our digital marketplace and self-service portals, we can help you stand out in a competitive market with digital user experience that brings together all your services. By moving up the value chain beyond connectivity, we can also help you expand into the enterprise cloud application and infrastructure markets. Bundling high-value B2B services with next-generation connectivity will help you become a more strategic provider to your customers. With up to 10 times lower entry cost than self-deployed solutions and flexible revenue share models, we can mitigate your risks of migrating to virtualization and cloud. This will help you experiment faster with new service offerings and expand into new vertical markets and off net customers. Netcracker Business Cloud has a broad range of service packages that are ready to go, leveraging an extensive set of pre-integrated VNF and cloud partners from our award-winning Ecosystem 2.0 program. By bundling cloud connectivity services, such as SD-WAN, with value-added network services, enterprise applications and IoT infrastructure applications, service providers can create and launch highly differentiated enterprise and vertical-specific offerings. New services and partner software are continuously added to Netcracker Business Cloud based on the service provider’s specific market needs.